These days, consumers’ attitudes, habits and socio-demographic details form some of the basic requirements for marketing. Processes before purchasing, the consumer’s preferred methods of using the products they buy and the exact mechanics of how these products make their way from the shelf into a consumer’s shopping trolley complement this knowledge. The list can be extended as, ultimately, additional data can be retrieved from sales and household panels, depth psychological findings, the most appropriately collected trends on the internet and so on. All this information is available to marketing departments and, when combined, represents the basis of successful marketing – consumer and shopper insights are crucial for the success of leading brand name companies. Yet, consumer and shopper insights only come into effect when the products are listed in shops, made readily available and presented excellently. In other words, without successful partnerships and cooperation with retail, the brand companies’ concepts cannot be effective. Consumer and shopper insights fall by the wayside if basic requirements, i.e. : awareness of retail – the most important target group in marketing – are neglected. ‘Retail insights’ is the name we at benchex give both the challenges for retail and the level of satisfaction retail has with its cooperation with suppliers. Only when brands know how to make targeted improvements to their cooperation with retailers can the real effects of marketing and sales concepts unfold. In most cases, retail is the touch point the consumer has with the brands and, based on these retail insights, should be integrated into the plans for marketing concepts with care and detail. 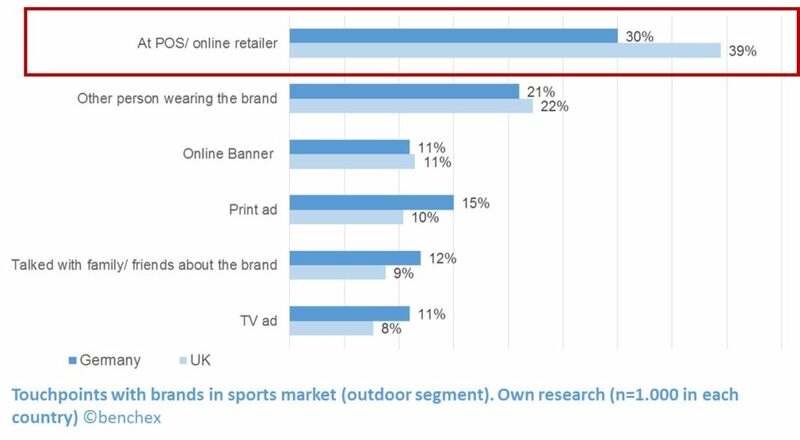 Results of our own research (Brand Audit© in the Sports/ Outdoor category in Germany and UK) demonstrate that interaction with brands at retailers (on- and offline) is the most important touch point when it comes to brand awareness – way before the final purchase decision of consumers. Our experiences of projects with brand name companies of varying sizes and in different categories, from across the globe, show that retail insights are neglected by most – they don’t understand how to integrate retail as an element of their marketing strategies. Equally difficult is the implementation of measures – mutual success (brands and retail) still requires optimisation. We keep discovering that brands believe they know a great deal about retail – but this “assumed knowledge” doesn’t conform to reality. What they think they know is just an illusion and, strictly speaking, could never be implemented in a real life setting. When you think of how retail and brands interface with each other, images of the sales department, the key account managers and field representatives will, of course, spring to mind. BUT: staff from the supply chain, customer service, trade marketing and category management departments also work with partners in retail. Similarly, end-user marketing also plays a role – do marketing or advertising campaigns create more retail traffic? Do marketing activities lead to more sales? The amount of interfaces (which, as a rule, many different people in retail also experience) makes it difficult to compile feedback from retail. Both a diverse range of functions and retail feedback which has to pass through many hierarchical levels make it difficult for top management to understand what’s going on… it’s more in our nature to pass positive feedback quickly and more accurately to those in charge than it is to communicate criticism. As there are multiple hierarchical levels to overcome, top management often receives information which doesn’t correspond at all to what’s really happening. Even if brand name companies keep both of the above points in mind and ask retail for feedback in the form of questionnaires, what’s actually lacking is calibration via brand competition. 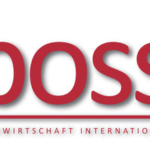 This feedback result may, indeed, both uncover a comprehensive spectrum and overcome the hierarchies – but the question as to where the company’s competitive strengths and weaknesses lie and how these should be tackled remains open. An example… in most categories, the topic of customer service often receives criticism from retail because customer services departments only come into play if there is a problem. Retailers expect swift, precise and immediate solutions, which isn’t always possible. Satisfaction in this area is, therefore, relatively low with all brands – only when compared with other top brands in the category can it be possible to make statements about relative performance. With our Retail Barometer©, we at benchex offer a tool which is implemented in commerce and which generates retail insights. It, therefore, takes the fact that this is a marketing process into account. 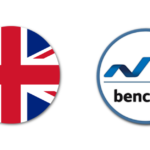 benchex has helped multiple brands in each category, evaluating the cooperation all top brands have with all functional interfaces (sales, trade marketing, supply chain, customer service, category management and end-user marketing). Furthermore, retail provides information on the importance of individual aspects for the benefit of its suppliers… the brands. benchex reports on the competitive strengths and weaknesses of each brand, identifies fields of activity and suggests concrete methods to them so they can optimise the way they cooperate with retail. The brands can, then, cooperate with retail to implement the retail insights gained by using the benchex Retail Barometer©. THE AIM: MORE COLLECTIVE SUCCESS FOR BRANDS AND RETAIL THROUGHOUT THE MARKETING PROCESS. Learn more about what we do and about why the Retail Barometer© is an important tool for controlling your retail-related processes. Using project examples, we indicate how the Retail Barometer©’s findings can be used in many different industries.